Add extra style to an existing bedding set with a Euro pillow sham or two. Available in colors ranging from white and neutrals to rich, darker colors, the tailored pillow sham fits easily over Euro pillows, or other square pillows, and is washable. Made of cotton and polyester, the sham features a wide edge border, giving it a classic style to blend with any bedroom decor. I got this in the mail yesterday to complete my new bedding set...and first (my fault) the pic showed 2 pillow shams...but when I opened it only one came out. In addition the back closure was to the right hand side instead of the middle as usual and did not close once I put my pillow inside. I had to use safety pins since my shams are fluffy. And last but not least the sham feels like sandpaper, not that I will be sleeping on them directly, but even with fabric softener they were still a bit rough. Very nice Euro Shams for the price. Usually like all cotton material or cotton linen blend. If it was i would like them better. When the suggestion to purchase these came up in my cart it said cotton blend so, I must not have realized the blend was cotton and polyester. I should have researched it more perhaps cause it appears i overlooked this detail. on the details page itself it does inform you of what kind of blend i believe, and on the packaging. On the packaging it says 65% polyester 35% cotton. This euro sham has no zipper closure. Overall it's a nice euro sham, just would have like it to be all cotton. Reading the reviews I was expecting a really thin, sandpaper like sham but that is not what I got at all. I got the black sham and although it is not like my 1000 count sheets it is really a good fabric for a euro sham - I do not use these to sleep or lie on they are just for looks and they look great on my bed. For the price this is a 5 star product - it is not what you would get if you paid $80 each like a lot of stores but it works. These shams were very well described and the color was perfect for my bedding. The fabric is sturdy, not soft, but they stand up nicely on and did not need to be pressed after I washed them.. Great price and quality. They look very nice as my display pillows for my black toile bedding set. Color doesn't wash out of it. This is a great buy! 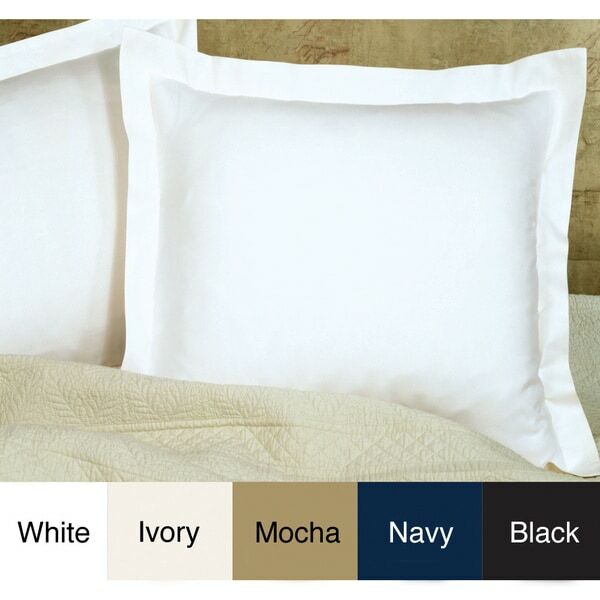 The color of the pillow shams was accurate and they fit perfect - all at a reasonable price. Very nice Ivory Euro Sham! Purchased beige/ivory color euro sham. True to color, nice fabric, well made. Fit euro pillow perfectly. Great packaging, delivered quick. Purchased matching bedskirt too, perfect color match. Pleased with item. These 26 Inch Euro Shams are very nice, crisp edges and a good clean white. 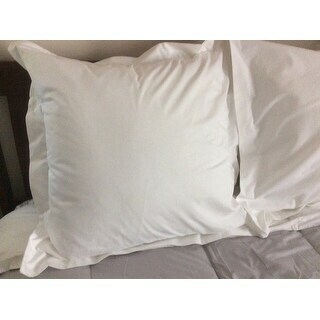 With the 28 inch euro sham pillows they are filled out to perfection and look wonderful on my bed. I am very happy to have purchased both of these items from Overstock. Excellent quality material. Rich color. Neatly sewn inside and out. The sham is definitely designed for a euro pillow (large and square). I mis-read the on-line info and was not familiar with the euro pillows when I ordered the product. But, because of the overally quality of the sham and the rich color, I have figured out how to make the sham work, using 1 or 2 standard pillows. The size problem was definitely my fault and not that of the sham. Since there is only 1 sham in the package, I think the item is a bit pricey. However, I would purchase this sham again because of the quality. Fit my Euro pillows perfectly. Color was an exact match to what was pictured online. Although it says it is 250 thread count, even after washing with fabric softener, the fabric is very coarse. I would not put my head on this to sleep and am using it for decoration purposes only. I was in need of blackI and deep red euro shams that I could not find anywhere. Came to Overstock and found them. They are awesome and if anyone is looking for Euro Shams. Overstock.com came thru again with what I needed. I bought 2 shams to use almost as a headboard for 2 twin beds until I can acutally find the headboards I want. These are good quality, but not so soft. Substantial, but not soft to sleep on. More for decorative use. I do llike them. the shams match the bedskirt and sheets perfectly and accent bedroom perfectly. The material is heavier than I expected and they iron out nicely. I only gave 4 stars because the opening in the back where you slide the pillow in doesn’t really close up well. It’s super easy to get the pillow in the sham but would have liked them to close up better. Otherwise they are well made and good for the price. They are a nice bold blue - they compliment the comforter that we just purchased from OS as well. Great addition to our bedroom suite. I'm a pillow lover and I loved them. The quality and appearance was beautiful. It just matched our comforter perfectly, Thanks. I love these Euro pillow shams. They are thick and sturdy so they keep their shape for a beautifully, decorated pillow. Look so great on my new king sized bed! Beautiful shams, perfect for my home. "What kind of closure do these have? Zipper, envelope, button? " It is an envelope closure. "Is the mocha sham golden?" "What size is it I need a 26 x 26"
Dimensions are: 26 inches wide x 26 inches long. "How many do you get in this order 1 or 2 shams"
"I have a striped, burgundy pillow I want to use the shams on. Do you think the white will be thick enough so I can't see the color of my pillow through the material?" No, it's very nice, if you want to put is over a white Euro pillow, but I believe the burgundy pillow would show through. The shams are a thicker material but burgundy may show throw, you might be able to put a pillow protector over the burgundy first then the sham.. I agree with the two answers above. "is the pillow included with this sham. If not where do i get one to fit i need three"
The pillow is not included with the sham. I got them from ******. No, pillow stuffers are not included. They can be found in most stores at a reasonable price. Haven't checked here on Overstock, they may have them. I had some, Overstock has them They are nice, a lot less expensive than the department stores. "Is the mocha color exactly as pictured? I am trying to get a medium tan color. Thanks!" sorry can't help, purchased white and they are great! It is pretty close to the picture - more of a taupe than tan. I purchased both white and mocha and they look great together.